Desktop Condor (DTCondor) provides an easy-to-use graphical interface which considerably simplifies the processs of submitting jobs to the ARC Condor pool. By using DTCondor, there is no longer any need to remember obscure UNIX commands or to transfer files to and from the Condor server manually. DTCondor is therefore ideal if you are new to Condor, dislike the arcane UNIX command line environment, or are an infrequent and fairly light Condor user. The DTCondor graphical interface (DTCondor for short) has been tested extensively (but not exhaustively !) on 32 and 64-bit versions of the Windows 7 operating system that forms the basis of CSD's Managed Windows Service (MWS). It may work on other versions of Windows but unfortunately there is no support for Macs or for Linux-based systems. DTCondor works best when used on the University campus network but off-campus use is possible via the Virtual Private Network (VPN). See the section of Using DTCondor from off-campus for details. If you would like to use DTCondor, please contact the Condor administrator (Dr Ian C. Smith, i.c.smith@liverpool.ac.uk ) in the first instance, as it will be necessary to set up the server side of things first. You will of course also need an account on the Condor service (for details see the Condor registration web page). This document provides an introduction to DTCondor and describes in detail how to use it for running applications based on MATLAB or R. Although it is not especially complicated, there is a lot of information presented here and it may be best to have a quick read through first and then try the walk-through examples before reading the guide again in depth. The examples should help familiarise yourself with DTCondor and can act as a starting point for your own applications. Hopefully the documentation should cover most things but if anything isn't clear or if you have any suggestions for improvements, please contact the Condor administrator as this will help to improve the documentation. 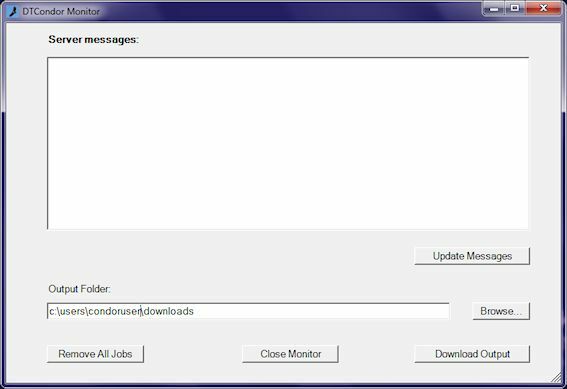 The DTCondor software is bundled into a Microsoft Installer (MSI) package which can be downloaded by clicking on the button below. Note that you must have administrator rights on your computer for DTCondor to install correctly and therefore DTCondor cannot be installed on teaching and learning centre machines. Another DTCondor icon (see left) should also appear as folder on the Desktop which provides easy access to folders used to store DTCondor data files (e.g. templates, input data, executables - more on this below). After a short while, the DTCondor Login window should appear as shown below. [NOTE: throughout this guide "condoruser" should appear as your own username when you actually come to use DTCondor]. Your username should already be filled in but if it is this incorrect, enter your correct Condor username (this will usually be the same as your MWS/e-mail username), then enter your normal MWS/e-mail password and click the Continue button. If you are unable to login, please contact the Condor administrator for help. The Main Menu contains a list of actions which you can perform with DTCondor. Usually either the second or third items are needed i.e. "create or edit a job template" or "submit jobs using an existing template" but if you wish to run MATLAB applications it will be necessary to create a stand-alone executable by selecting the first option, "build a stand-alone MATLAB executable". This is the subject of the next section so if you are not interested in MATLAB just skip to the Introduction to Job Templates section. It is not possible to run large numbers of MATLAB scripts (i.e. M-files) directly on the Condor pool because of licensing restrictions and so any MATLAB code used will first need to be compiled or "built" into a stand-alone executable which can run without a license. For very simple applications, most users will place all of their code in a single M-file but often, as things become more complicated, it may be necessary to move some of the code into other M-files. By design, DTCondor can be used to build stand-alone executables from either a single M-file or from multiple M-files. The M-file containing the main part of the program (which calls other M-files) is imaginitively referred to here as the "Main M-file" while the other M-files (perhaps containing your own MATLAB functions) go by the equally prosaic description of "Other M-files". step is to select the "Main M-File" and (if necessary) the "Other M-files". You can type the filenames by hand including their full path or (much easier) use the Browse button to locate the files and select them. By default, all of the files will come from the M:\matlab64 folder since this is also the default folder for the current version of MATLAB on the MWS. A different default folder can be selected by using the "M-file folder" option. Alternatively, the M-files can be selected in a different folder (the "Main M-file" does not need to be in the same folder as the "Other M-files"). Once all of the files needed have been selected, click on the Continue button and the build process will start. So what happens next ? 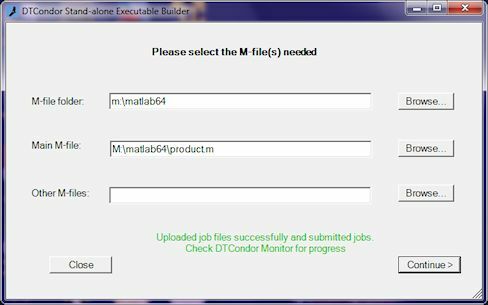 Behind the scenes, DTCondor will transfer the M-files plus some other bits and pieces to the Condor server and submit a Condor job which will build the executable using one of the pool PCs (this ensures that your executable is created in the same MATLAB environment that it will run under). Once the job has completed, you can then download the executable and use it for running large batches of "real" jobs. The progress of the build job can be tracked by using the DTCondor Monitor window. A detailed discussion of this will be saved for the section on Monitoring Progress, but suffice it to say here that the Update Messages button can be used to see what the Condor server is up to and the Download Output button can be used to download the stand-alone executable once it has been created. what application needs to be run (in other words, what is the executable file or script) ? how many times does the application need to be run (i.e. how many jobs are required) ? what input data needs to be processed (alternatively, what are the input files) ? what input data is the same for every job (this will be held in the "common input files") ? what input data is different for each job (this will be held in the "indexed input files") ? In a Monte Carlo or other stochastic analysis application, for example, the indexed input files may contain different random number generator seeds. In a pharmaceutical field trial, the indexed input files might contain data from different patients. what output data should the application produce (i.e. what will the output files be) ? This turns out to be very useful in catching errors and so it's a good idea to always provide it if possible. In the past, all of the above information would need to be supplied to Condor by typing it into a text file. 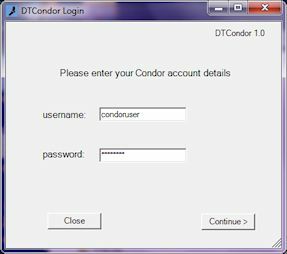 This was both cumbersome and error-prone and therefore DTCondor allows users to enter the information via a graphical interface. 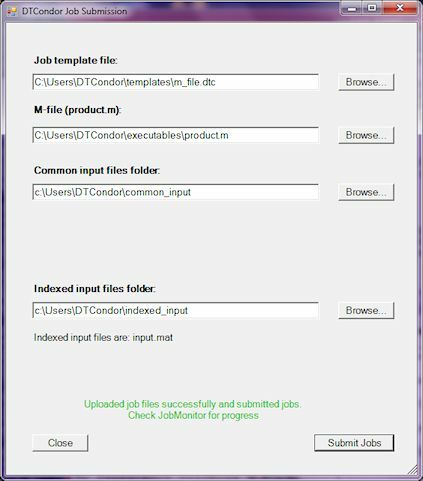 [If you have used the Condor service previously, then it's worth pointing out that job templates are essentially the same as simplified job submission files but are hidden and do not (and should not) need to be edited "by hand"]. After a job template has been created, it is straightforward to submit large numbers of jobs and make small changes to the analyses/simulations as needed. Going back to the earlier examples; in the Monte Carlo case, a different model could be used just by changing the underlying code and running it again with the same random number seeds (for MATLAB, the code would also need to rebuilt). This would provide a direct comparison between the two sets of results. In the pharmaceutical example, a new set of field trial data could be processed just by replacing the input files. The Job Type box is used to select which kind of application is to be run. 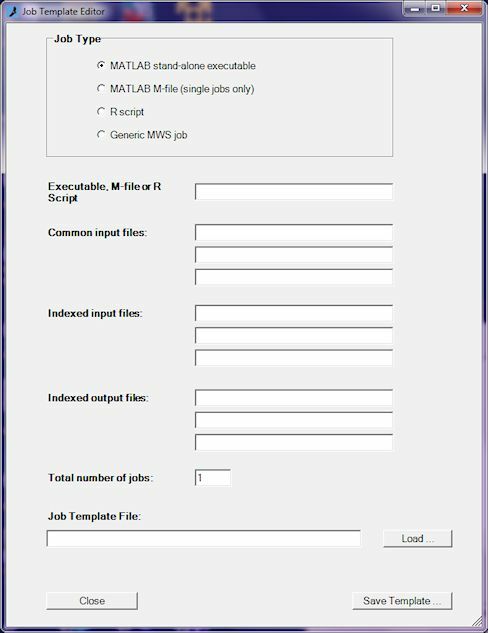 The "MATLAB M-file" option allows you to run a single job based on one or more M-files (rather than a stand-alone executable) and is useful for testing. 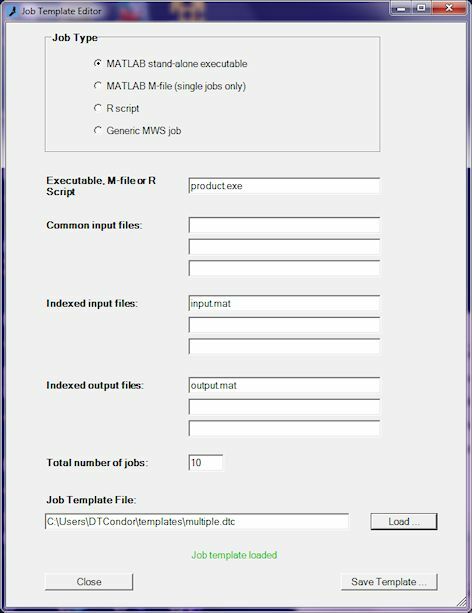 The "Generic MWS job" option is provided for backwards compatibility and is not really aimed at new users (if you do need to run applications that are not based on MATLAB or R, please contact the Condor Administrator for advice on how to proceed). 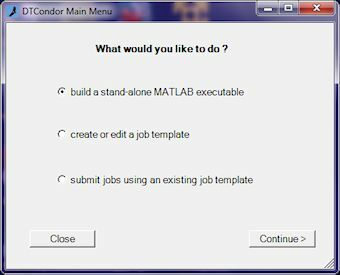 The "MATLAB stand-alone executable" option, as it suggests, can be used to run MATLAB applications using executables built earler using DTCondor. Finally the "R script" option can be used for jobs employing one or more R scripts. 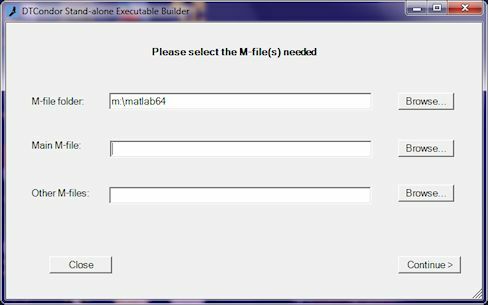 Type the name of the main M-file in the "Executable, M-file or R script" text box. Enter the name of the executable that was built previously and downloaded (this should have a .exe extension). Enter the name of the main R script (i.e. the script that calls any other R scripts) - this will usually have a .R extension. The executable can be either a DOS batch (.bat) file or a binary executable (.exe file). In each case, only the name of the file is needed - not the complete path to it. The next step is to fill in the details of the input and output files in the text boxes below the executable option. Filenames can be entered one per line and (if there are several of them) multiple filenames can be entered in the same box separated by one or more spaces. There is no need to put in the actual path to the file - just the filename itself. The actual files to be used will be selected when you come to submit the jobs. The "Common input files" boxes can be used to specify which files are the same for all of the jobs and may only be needed for a few applications. Common input files can be useful if (for example) you have look-up data which is needed by all of the jobs and which is the same for each. In the case of R applications, all of the other R scripts apart the main one are counted as common input files and need to be given here. For a "MATLAB M-file" job, enter the names of the "Other M-files" in the "Common input files" text boxes as these are counted as input files. (note that the indices start at 0 not 1). 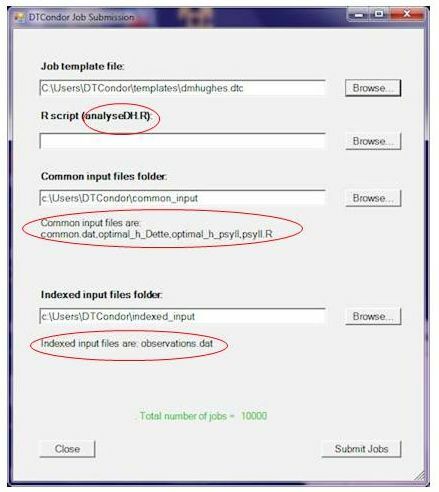 There is no need to specify the actual index value in the text box or in the underlying MATLAB code as all of the index manipulation will be done for you behind the scenes. Again there is no need to worry about the index value either in the template or in your code - everything will be taken care of automatically in the background. Indexed output files are optional but their use is recommended. The reason that specifying the output files is so important is that it allows Condor to flag an error if any of the files are missing after the jobs have run. Put another way, Condor can only determine if something has gone wrong if it knows what outputs are expected. For the very simple examples given below, it is quite easy to spot if things have gone wrong but when submitting very large batches of jobs (we've seen 40,000 jobs in a few cases) it can be tedious to say the least to have to sift through all of the output files to confirm that they are all in fact there. The "Total number of jobs" option should be fairly self explanatory and determines the amount of times the executable will be run by Condor with different input data. The number of jobs must tally with the actual number of indexed input files used. and by saving templates there, they will be easier to locate in future; however you can select any folder you wish. and all files with a .dtc extension will be shown (for generic MWS jobs, switch the filter to .mws to see the relevant templates). You can select one of these and the information contained in it will be displayed in the editor window. You can also load templates from another location by navigating to them. After all of the changes have been made, click on the Save Template button to save the file. The template can be saved under a different filename if you want to keep the old template. Once you have finished using the Job Template Editor, click the Close button to go back to the Main Menu. but you can browse to other folders if the required template has been saved in a different location. Also, by default, only standard template files (those with a .dtc extension) are shown. If you are using a generic job template file, then the file filter will need to be changed to *.mws in order to see those files. After a job template has been loaded some additional information should appear in the window; namely the executable or script file, the common input file(s) (if any), the indexed input files and the indexed output files (if any). An example is shown below where the various files have been circled. The total number of jobs will also be shown in green near the bottom of the window. Before submitting the jobs, you will first need to select the actual executable or script to be run. To do this, browse to the file by clicking the Browse button under either Executable file, R Script or M-file (depending on the job type), then select the file and click Open (you can also type the full path to it directly into the text box). If the files are located elsewhere, either change the folder displayed in the text boxes or (much easier) browse to the folders using the Browse button (if there are no common input files then the folder is irrelevant so don't worry about it). Once the correct folders have been selected, you can submit the jobs by clicking the Submit Jobs button. DTCondor will do a quick check to see that all of the files needed are in fact present before submitting the jobs to the server and will issue an error message if any are missing. It will then bundle the files into a ZIP format file and upload it to the Condor server for submission. To check that the jobs have actually been submitted properly (and to see how they are progressing) we need to move to the previously sidelined DTCondor Monitor window which is the subject of the next section. For now, you can close the DTCondor Job Submission window to get back to the Main Menu. You can check how your Condor jobs are progressing using the DTCondor Monitor window. This will open once you have successfully logged-in as shown below. The information is not refreshed continuously (to avoid overloading the server) but by clicking on the Update Messages button, the latest information will be retrieved from the server and displayed. The DTCondor server is running and is ready to accept jobs. It's worth trying this now just to check everything is working. All of the jobs have now been submitted and none have completed so far. (To see your own jobs, enter your username in the text box and click on the Submit button). DTCondor can also be closed on the PC and started again later without affecting any of the jobs. As well as giving more in-depth information than DTCondor, the website has the advantage that it can be used anywhere (including off-campus) without the need for DTCondor to be installed. It is therefore ideal for checking quickly how your jobs are faring whilst away from the office. Once all of the jobs have completed, you should receive this message. All of the jobs have now completed. If you would like to save them to a different folder just use the Browse button to select the desired folder or type the full pathname into the text box. The output files will be compressed into a ZIP file which can be extracted later (right-click on the file in Windows Explorer and select Extract All...). You can also download the partial results at any time whilst jobs are running by clicking the Download Output button. This can be useful as a check that everything is working correctly. In this case, all of the output files will be downloaded including any log files etc. Removing Condor jobs - this may take a while. All jobs have been removed. If the jobs refuse to terminate, please contact the Condor administrator. You can safely remove jobs at any time without destroying the results obtained so far which can always be downloaded using the Download Output button. In fact the output files from a given batch of jobs will remain on the server until a new batch of jobs is submitted. It is possible to submit jobs and retrieve their output files from off-campus using DTCondor however, because direct access to the Condor server is blocked to the outside world, it will first be necessary to establish a connection using the Virtual Private Network. You can find details of how to do this on the CSD page on Virtual Private Network (VPN). If you have difficulties using DTCondor it still possible to use the command line interface and retrieve files using secure FTP. Details on this can be found on the remote access to Condor web page. Note that submitting Condor jobs and retrieving the results can require the transfer of large amounts of data so a fast reliable connection will be needed. Although only a single M-file is used, the extension to applications using multiple M-files is straightforward. To begin with: download the M-file by right-clicking on this link product.m and selecting Save Link As... You can save it anywhere on your PC but if you save it to the folder M:\matlab64, then that will simplify things later. and login using your ordinary MWS username and password. If you have previously saved the M-file to the M:\matlab64 folder you can skip this step. If not, then type the name of the folder in the "Main M-file folder" text box or better still click the Browse button to locate it (this is easier and less error-prone). The main M-file, product.m, now needs to be selected. The easiest way to do this is to click the Browse button to the far right of the "Main M-file" label and select product.m. Alternatively you can just type in the filename including its full path, for example : M:\matlab64\product.m. If your application contained multiple M-files then the next step would be to select them. The easiest way to do this is to click the Browse button to the far right of the "Other M-files" label. After the file browser window appears you will need to select all of the remaining M-files. There are two ways to do this: either hold the SHIFT key down and left-click on the first file and then the last file or hold down the Ctrl key and left-click on each file. When all of the required M-files are highlighted click the Open button. You can also type the filenames including the full paths to them. Note that the "Other M-files" do not need to be in the same folder as the "Main M-file". The MATLAB Stand-alone Builder window can now be closed by clicking the the Close button to return to the Main menu. meaning that the stand-alone executable has been built successfully and can now be downloaded. by either typing the path into the text box or, better still, selecting the folder via the Browse button. This example shows how to submit multiple MATLAB jobs using the stand-alone executable built earlier. Again the application is exactly the same as that described in the web page on MATLAB Applications and the executable just reads two input matrices, multiplies them together and writes the results to an output file. The input files will have the form input<index>.mat and the corresponding output files output<index>.mat. Note that the index does not need to be specified either in the MATLAB code or any of the templates as all of the index manipulation is done for you in the background. Similarly, there is nothing special about the filenames chosen and any filename of the form <basename>.<extension> will suffice. However, spaces should not be used and it is best to stick to letters and numbers (and possibly hyphens or underscores used to make things more readable). Only one other file is needed - the stand-alone executable product.exe. This should have already been built earlier and if you have not already done so, copy this to the default executable folder i.e. If any changes were needed, for example the number of jobs or input files, then this would be the place to make them. You can try this now by changing some of information and you should see that a message warning you that the template has not been saved appears at the bottom of the window. To make the changes permanent, you could then click the Save Template button to save them to a file. In this case, no changes are needed so just click Close to get back to the Main Menu. Once a template file has been loaded, the next step is to identify the actual files to be used with the jobs. Firstly, you will need to select the stand-alone executable. To do so click the Browse button under the Executable file text and select the previously built executable (product.exe). There are no common input files for this example so skip over that option to the Indexed input files folder option. If you have previously saved the input files (product0.mat ... product9.mat) to the default location i.e. then there is no need to change anything but if they were saved to a different folder, this should now be selected by browsing to it using the Browse button below the Indexed input files folder: text. Since the Job Submission window is no longer needed, it can be closed by clicking the Close button to return to Main Menu. By repeatedly clicking Update Messages, you should see that the jobs eventually start to run and, after a while, complete. For example here five of the ten jobs have completed. You can shut down DTCondor at anytime and start it again later without it affecting any of the submitted jobs. It is also possible to get detailed information on how your jobs are progressing by visiting to the Condor website (condor.liv.ac.uk) which is accessible from anywhere (even outside of the University network). The input files will still have to be indexed in form input<index>.mat (and the corresponding output files output<index>.mat) even though for this example there is only one input file input0.mat. Note that the index does not need to be specified either in the MATLAB code or any of the templates as all of the index manipulation is done for you in the background. Similarly, there is nothing special about the filenames chosen and any filename of the form <basename>.<extension> will suffice. However, spaces should not be used and it is best to stick to letters and numbers (and possibly hyphens or underscores used to make things more readable). If any changes were needed, for example the input file, then this would be the place to make them. You can try this now by changing some of information and you should see that a message warning you that the template has not been saved appears at the bottom of the window. To make the changes permanent you could then click the Save Template button to save them to a file. In this case, no changes are needed so just click Close to get back to the Main Menu. Once a template file has been loaded, the next step is to identify the actual files to be used with the jobs. Firstly, you will need to select the main M-file. To do so click the Browse button under the M-file text and select the previously downloaded M-file (product.m). There are no common input files for this example so skip over that option to the Indexed input files folder option. If you have previously saved the input file (input0.mat) to the default location i.e. then there is no need to change anything but it was saved to a different folder, this should now be selected by browsing to it using the Browse button below the Indexed input files folder: text. By repeatedly clicking Update Messages, you should see that the job eventually starts to run and, after a while, complete. This example shows how to submit R jobs using DTCondor. Although only a single R script file is employed here, the extension to applications that require multiple R scripts is straightforward. The application is exactly the same as that described in the web page on R Applications and it calculates a frequency distribution for a very large number of observations stored as R data files. The input files will have the form observations<index>.dat and the corresponding output files results<index>.mat. Note that the index does not need to be specified either in the R code or any of the templates as all of the index manipulation is done for you in the background. Similarly, there is nothing special about the filenames chosen and any filename of the form <basename>.<extension> will suffice. However, spaces should not be used and it is best to stick to letters and numbers (and possibly hyphens or underscores used to make things more readable). If any changes were needed, for example the number of jobs or input files, then this would be the place to make them. You can try this now by changing some of information and you should see that a message warning you that the template has not been saved appears at the bottom of the window. To make the changes permanent you could then click the Save Template button to save them to a file. In this case, no changes are needed so just click Close to get back to the Main Menu. Once a template file has been loaded, the next step is to identify the actual files to be used with the jobs. Firstly, you will need to select the main R script. To do this click the Browse button under the R script text and select (analyse.R). There are no common input files for this example so skip over that option to the Indexed input files folder option. If you have previously saved the input files (observations0.dat ... observations9.dat) to the default location i.e.